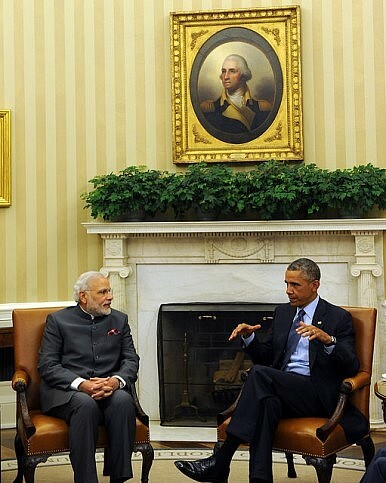 Narendra Modi and Barack Obama have created some positive momentum in Indo-U.S.security and defense ties. Indian Prime Minister Narendra Modi has wrapped up a momentous maiden voyage to the United States. On Tuesday, he met with U.S. President Barack Obama at the White House, which resulted in the customary joint statement. Obama and Modi had to that point spoken exclusively on the phone. Regardless of this meeting’s status as an ice breaker for the two leaders, the joint statement points to a bright future for U.S.-India cooperation in security and defense matters in particular. The two even penned a joint op-ed for the Washington Post. Below I’ve highlighted 10 observations on security that stand out from the statement and help reveal where cooperation between India and the United States might be heading. 1. The statement isn’t revolutionary on security matters; it is rather evolutionary, signaling the broad contours of where U.S.-India cooperation on security might head in the Modi era. Most significant in this sense is the fact that Obama and Modi renewed the 2005 New Framework on Defense. That agreement, signed under George W. Bush and Manmohan Singh, ushered in a new normal in India-U.S. defense ties. India began conducting more joint exercises with the United States than it did with any other country. Last year, the United States managed to dethrone Russia as India’s top defense equipment provider. These developments would not have been possible without the 2005 Framework. Still, Modi and Obama could have gone the extra mile here and developed the terms of the Framework further for modern challenges–while that didn’t happen directly, the rest of the statement contains several hints as to where an extension of the framework may lead. 2. One phrase that catches the eye is the declaration that the U.S. and India will “treat each other at the same level as their closest partners” on issues including “defense technology transfers, trade, research, co-production, and co-development.” This is a positive step towards expanding the scope of the 2005 Framework. The language referring to treating one another as each would its “closest partners” has made an appearance before at the ministerial-level Defense Technology and Trade Initiative (DTTI), an initiative intended to move the U.S.-India defense relationship from a patron-client to partnership model via increasing co-development and co-production of defense technologies. 3. The statement has a particular focus on moving U.S.-India defense ties forward on a very operational/tactical level. It sees India endorse plans “for the United States to cooperate with India’s planned National Defense University” — a positive step that will likely lead to greater military-to-military contact between the two countries. In broad terms, the statement emphasizes the intention of both countries to “expand military-to-military partnerships including expert exchanges, dialogues, and joint training and exercises.” These developments will undoubtedly be positive for Indo-U.S. defense cooperation, expanding the familiarity between the two countries’ armed forces and increasing their interoperability in times of crisis. India and the United States won’t be allies any time soon, but per this agreement, their armed forces will work together better than ever. 4. Likely of some interest to Diplomat readers following developments elsewhere in the Asia-Pacific, this joint statement is the first to feature both India and the United States supporting freedom of navigation in the South China Sea. Under Modi, India is sticking to its guns in terms of repeatedly emphasizing its commitment to the principle of the freedom of navigation and the United Nations Convention on the Law of the Sea. The joint statement signed recently between Indian President Pranab Mukherjee and his Vietnamese counterpart also featured similar language. The subtext here, of course, is pointed at China. 5. Notably, the statement mentioned India’s “Act East” policy — a more activist restatement of its 1990s-era “Look East” policy. According to the statement, we should expect to see a U.S.-India-Japan trilateral meeting at the foreign minister level take place soon. I’m sure China will be thrilled. India and Japan have a Strategic Global Partnership and are actively expanding security cooperation, particularly on maritime issues. The United States, meanwhile, is a treaty ally to Tokyo. The India-U.S. leg of this trilateral has thus traditionally needed the most work. Trilateral consultations between the three countries began in 2011 and have significant scope for growth. 7. The statement understandably has a broad focus on countering terror groups in South Asia and elsewhere. The statement mentions the Islamic State, Al Qaeda, Lashkar-e-Taiba, the Haqqani Network, Jaish-e-Mohammed, and the D-Company. The statement was relatively specific on areas of U.S.-India cooperation on counter-terrorism, highlighting the “dismantling of safe havens for terrorist and criminal networks, to disrupt all financial and tactical support for networks.” Furthermore, the statement identifies areas for growth in bilateral cooperation on criminal law enforcement, military information exchange, and legal cooperation — all areas where considerable lacunae exist in Indo-U.S. security ties. In the context of cooperation in these areas, the statement mentions interdicting terrorist activities in cyberspace — an area of concern for both countries. 8. Funnily enough, the statement points out that Obama and Modi “committed to pursue provision of U.S.-made mine-resistant ambush-protected [MRAP] vehicles to India.” This is particularly revealing given that the United States finalized the sale of 160 MRAPs to Pakistan just days before Modi was scheduled to land in New York (this too after the top U.S. commander in Afghanistan indicated this wasn’t on the cards). As the United States pulls out from Afghanistan, there is concern in India that Pakistan will likely reap the benefits of gaining access to U.S. military hardware at bargain prices. India has historically been frustrated with the United States’ tendency to arm Pakistan while professing its desire for closer ties with India. While the inclusion of a potential MRAP sale to India is in itself is less significant, it does suggest that Modi broached the issue of U.S. hardware sales to Pakistan during their meeting. 9. The language’s statement on Iran was remarkably forthright — which is understandable from the United States’ perspective, but still surprising as India maintains a close relationship with Tehran. The statement called on “Iran to comply with its UN Security Council-imposed obligations and to cooperate fully with the International Atomic Energy Agency,” refraining from commenting on the specificities of the ongoing negotiations between the P5+1 and Iran. 10. Make what you will of this, but the phrase “human rights” is nowhere to be found in the entire joint statement. This includes a section on North Korea which focuses exclusively on the country’s international obligations and denuclearization.